Campus chapters are the heart of URGE’s work. 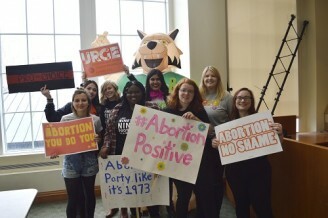 All over the US, groups of dedicated students are working tirelessly for reproductive justice -- tackling issues specific to their campus, speaking out about state policy, & contributing to national campaigns. Feminist Equality Movement (FEM) is an organization composed of Ohio University students committed to furthering the intersectional feminist vision on and off campus. We strive to educate ourselves and others to understand and challenge systemic inequalities through activism, advocacy and outreach in the political and cultural sphere.